The RT series subwoofers were serous pieces of equipment and very highly regarded. I don’t think the amp in the K100SW would be a good match for a woofer that was designed to handle 700 watts RMS. I would imagine that sub amp is optimized for that woofer and was designed that way by Klipsch. Just my thoughts in the matter. You can always build a box for the driver and use an external amp like a Inuke to power it. What was the asking price of the driver you almost bought? 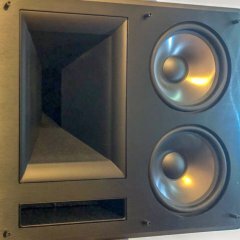 Problem with going this route is that if you're going to build a box for a DIY sub, you might as well buy an 18" Ultimax instead of the 10" Klipsch driver.